Balconies are a great amenity for urban apartments. They allow the residents to get immediate fresh air without having to go down to the courtyard or the street. They also give a building legibility; balconies say "people live here!" A bay of balconies can also break up a long facade and give it some rhythm and visual interest. However, at the ground floor this amenity is sometimes treated as a fenced-in private patio. While this is fine within a courtyard, I strongly recommend against this adjacent to a street. The patios, which sometimes have high fences right at the back of the sidewalk, create a tunnel effect which makes the street feel very unfriendly. Enclosed patios create a blind sidewalk. This makes pedestrians feel uncomfortable, and sometimes unsafe, due to the absence of "eyes on the street." The street-side of the building must always be treated as the front of the building, especially in downtowns and walkable neighborhoods. Buildings shouldn't be allowed to turn their back to the sidewalk, they must embrace it. So instead of a patio, use a porch! A porch... on an apartment building? 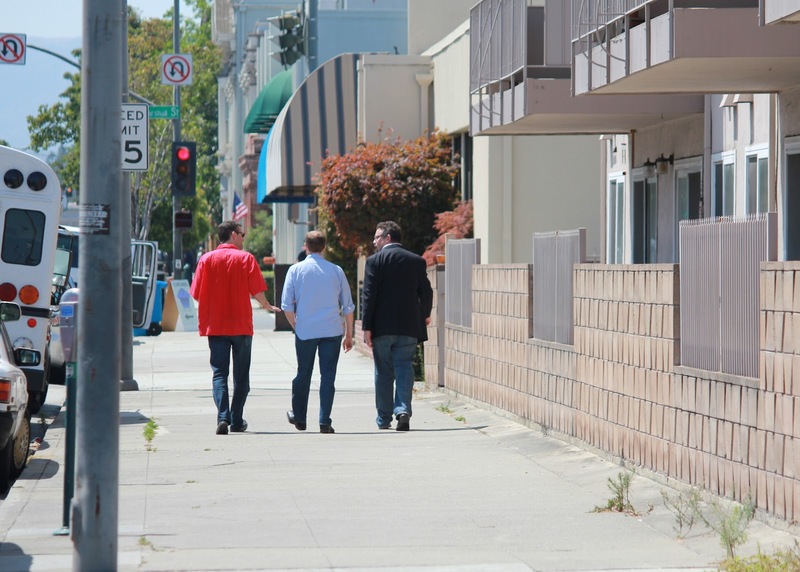 Porches are the right way to provide a semi-private open space amenity next to the sidewalk. We often think of front porches as something that is appropriate in a suburban context, particularly on single family homes. Clearly, they can be delightful in that context, but they can also be used in apartment buildings in an urban context. Like stoops, they can be a great way to avoid the blank walls that sometimes come with large apartment buildings. Porches provide a major benefit because they are an active frontage. Frontage is the the interface between the ground floor of a building and its adjacent sidewalk area. Frontage is active when it has windows and doors, which means that the residents are watching, coming, and going. 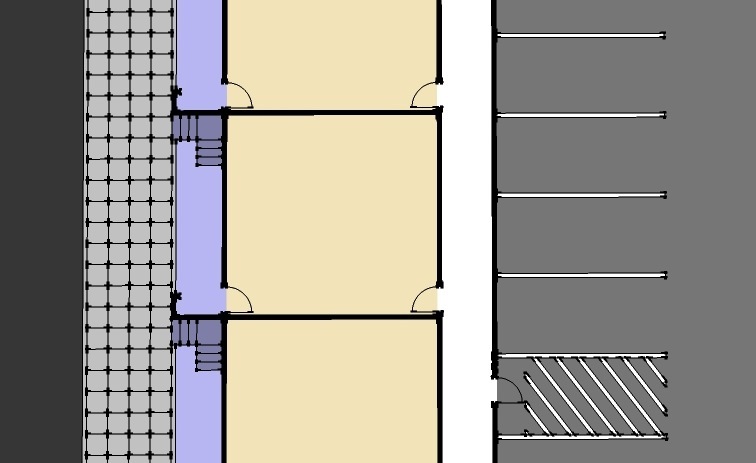 A majority of the ground floor should have active frontage (understanding that sometimes not all of it can, due to mechanical rooms, garage entrances, fire exits, etc.). Vancouver, Canada is famous for its point towers, which are tall, slender residential high rises. These buildings are subject to some very strict zoning rules which control things such as maximum floor plate size (about 6,400 square feet) and minimum spacing between towers (at least 80 feet). These are great innovations that have allowed Vancouver to build a lot of housing in a very beautiful and livable manner, but the friendly bases of these buildings are just as important as the stunning towers. The bottom few floors of the buildings are much wider are than the towers due to the parking garages, but the garages are wrapped with retail on major streets and residential units on minor streets. The residential units each have their own entrance to the sidewalk. Stoops are used most often, but many of these buildings have porches, also. The care that is put into getting the frontages right gives the streetscapes in Vancouver a very comfortable, safe, and interesting feel, despite the sleek towers looming above. 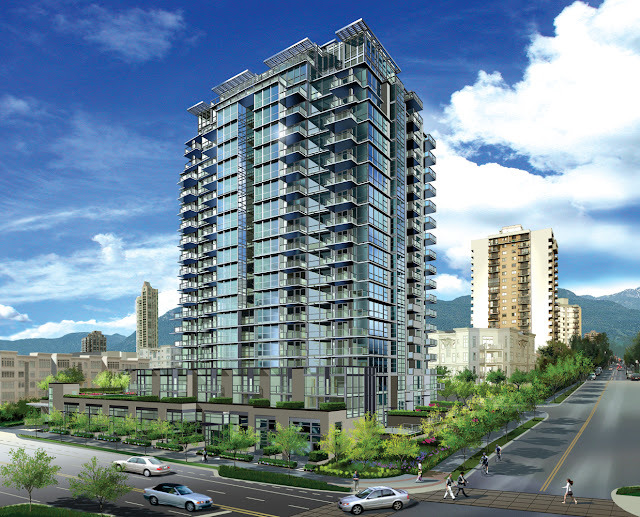 While Vancouver's point tower residential model is a fairly new concept, wrapping large uses with active ground floor uses is actually an old trick. Many of the movie palaces of the 1920s had a magnificent lobby entrance which was usually no wider than 50 feet, while the rest of the frontage was lined with small retail spaces. The mass of the theater was usually buried in the middle of the block. The red awnings on Fresno's Warnor's Theater, below are for this sort of liner retail shops. In the past, we didn't really need to worry about frontage. Blocks were usually subdivided into 25' to 50' wide lots, each lot was sold to an independent owner, and each of them built an individual building on their lot. Each building needed an entrance, right? So, automatically, you had a pattern of at least one entrance every 25 to 50 feet. On top of that, in the era before auto dominance, frontage was really important. The pedestrian was king, and no one wanted to waste access and visibility with blank walls back then. Frontage was so important that retail rent and property taxes were often based on frontage instead of square footage, which is why many lots were narrow and deep. Here's how a porch works on a modern apartment building. The front door on the porch is actually one of two entrances into the apartment. The second door leads to a corridor which provides access to the parking garage and the elevator lobby, just like all of the upstairs units. The floor of the apartments is usually raised a few feet above the sidewalk level to provide extra privacy and this means that an entry stair, or stoop, is needed. Don't worry, the corridor entrance, which is the only entrance for the upstairs units, provides wheelchair accessibility. The porch railing should be low and transparent to provide eyes on the street. The porches can protrude from the main building facade, or be recessed into it, and there can be a small front yard setback or none. 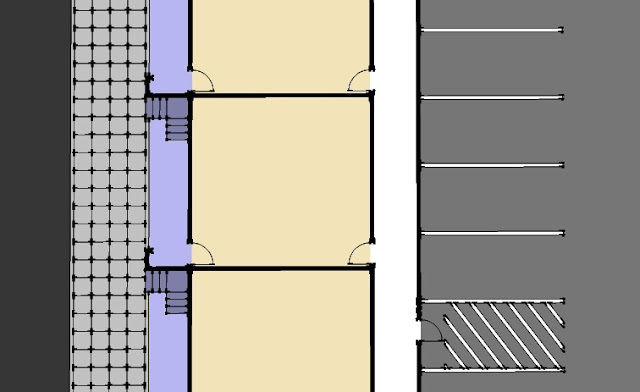 The graphic below shows the basic layout of ground floor units with porches (in purple). In this example the porches are recessed into a building and there is no front setback. Some people might say that these porches, and their entrances to the sidewalk, are undesirable to the tenants of these apartments because of strangers, solicitors, or the homeless. I don't find this argument convincing. In most locations, I'd be willing to bet that you can find single family homes nearby with their own entrances to the street, and it probably works just fine. It will work fine on the new building too. Not only that, but the residents will love having front door acres to their neighborhood, which is a rare commodity in dense urban apartments. So let's bring back the porch and use it, along with stoops, to enliven the non-retail streets in our downtowns and neighborhoods! Can you imagine how the dragon glass killed the white walkers and make the in stable for the cause and the fight. I guess hey are sitting on the mountain of the dragon glass and have the best atmosphere in the action like winds.